Bagging and boarding your comic books after they have been purchased and read are the most basic steps in the preservation of your comic book collection. When it comes to bags, there are two basic types to choose from. This article will outline these and explain the pros and cons of each. 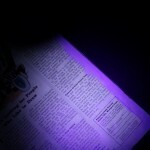 The article will also discuss the importance of backing boards and comic book extender sheets. These comic book bags are suitable for short-term storage (up to two years). Within this time, the bag will cloud/ yellow, and wrinkle. In fact, I have noticed wrinkling in these bags as early as a few weeks after bagging a comic book. Although these comic book bags are the most inexpensive (around 10 cents per bag), the fact that they need to be changed often can be a real negative for most, especially for those who have very large collections. 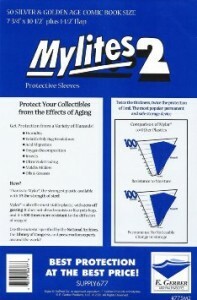 E. Gerber’s ever popular Mylites 2 Mylar comic bag. Mylar is a clear material made from polyester resin. Mylar comic book bags possess many desirable properties including gas and moisture resistance, chemical stability and high tensile strength. Mylar products tend to be the staple comic book bag for serious collectors. I use the Mylar products manufactured/distributed by E.Gerber Products. I especially like the Mylites+ line, which are 1.42 mil thick. These are easy to work with and they make any comic book look fantastic. Mylars are wonderful, but they do come with a price, costing more than twice the price of a poly comic book bag. The Mylites+ I like to use, for example, sell for around 25 cents per comic bag. E.Gerber also sells 2mil and 4mil Mylar comic book bags (which are also quite awesome), but the thicker you go, the more you pay. Many collectors don’t like thicker bags as their firmness could potentially harm a comic book as the handler tries to insert the comic into it. On the other hand, I know collectors who use nothing but the thicker Mylar comic book bags. After all, once inserted, the thicker Mylar comic book bags will obviously provide superior protection. E.Gerber’s Mylar comic book bags can be purchased directly from their site, or ask your local comic book shop to order you some if they do not stock them. Comic book backing boards help prevent spine damage. Boarding your comics is equally as important in the preservation of your comic books as they help keep your comics rigid when stored, hence protecting your book from spine damage and other potential defects. In the old days, I would use any old firm piece of card board, in fact, the comic book store I frequented would simply have pieces of card stock cut to the appropriate size. Nowadays, acid free backing boards are recommended as they will ensure that the boards themselves will not emit potentially harmful contaminants as they age, protecting your comics even more. Acid free backing boards are very smooth to the touch and coated white on either one or both sides. Some collectors will double-up on boards to ensure maximum protection. 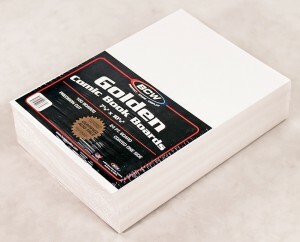 Companies like E. Gerber Products and BCW Collector Supplies offer quality backing boards, yet many comic shops have their own acid free boards cut as well. Depending on quality and thickness, expect to pay between 5 and 20 cents per board. Comic book extender sheets will help prevent page yellowing. A new addition to the bagged and boarded comic book are book extender sheets. If you have ever cracked open a graded comic, you will notice that two of these sheets were placed inside of your comic book. 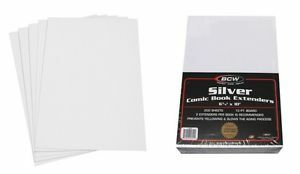 Comic book extenders, according to BCW Supplies, will help prevent yellowing, retards the aging process, and absorbs and neutralizes the contaminants in comic book pages. These 10 mil sheets go inside the book, next to the paper and ink one fourth of the way in from the front and back covers, only two sheets per book are needed to aid in the preservation of your comic books. Each sheet costs around 10 cents.